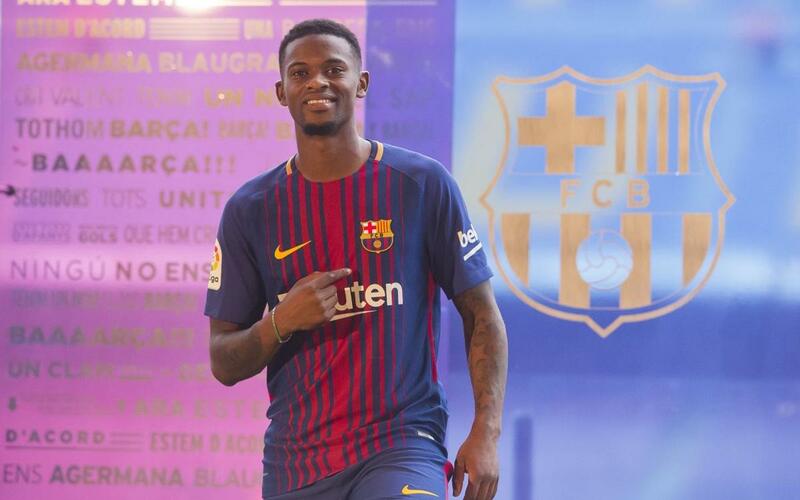 First, I would like to thank Barça for this opportunity and the confidence they have placed in me, I am very proud to wear the shirt, and you can count on me for everything. I'll do everything I can for this club. I love this club, it's a great club. I knew that already, but I've realized it today. I like the city a lot as well. I love playing. I never give up on a ball, I play until the final whistle. Barça can have every confidence in me. I will do everything I can to honor the shirt. I originally played at Benfica as a midfielder, but the manager decided I would be better off as a full-back, so I became a professional as a full-back. I try to learn from everybody, I take a little bit from here, a little bit from there, to learn from the best qualities from everybody, and I try to apply my own style of football too. I'm sure that Barça can explain that better than me, but in the last four years I have developed a lot, created a new style of play thanks to the managers and the teams I've been with. They helped a lot. If it wasn't for them, perhaps I wouldn’t be here today. So, I can only thank them. And I repeat, I'm ready for the challenge and you can trust me to deliver. Everybody wants to play at Barça, I'm no exception. I was very excited by the news, but I also understand the responsibility, and I am very happy and looking forward to starting with the team.